Even though I live in north Louisiana, we are getting prepared for Hurricane Gustav as well. It's projected to move up to Shreveport, which is west of where I live. We're on the "wrong" side of the hurricane (or tropical storm) so that may mean drenching rains, wind, and tornadoes. So how do you prep a garden for that kind of potential? Well, I'll admit to be a novice at this, so I'm just guessing. (Katrina was on our "good" side so we only experienced cloud cover and Rita, though we felt its affects, flew through east Texas so fast that we were spared fairly well.) 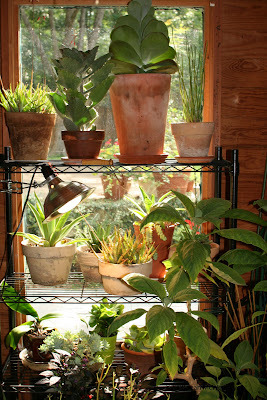 What I decided to do, besides moving potential loose items to cover, is move all my potted succulents to my potting shed so they wouldn't drown. They've had plenty of rain this August already. So you can see in the above photo how they're all nice and snug and ready to ride out anything. I also moved my brugmansia in there since its big leaves tend to shed when whipped by wind. All the other potted plants, which are big and in heavy pots, will just have to hang on. The rest of my garden too! 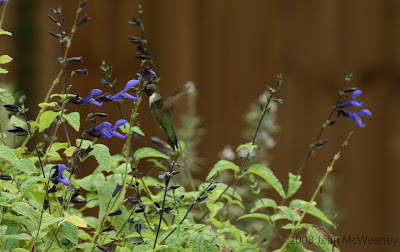 I took a photo of a Ruby-throated hummingbird visiting my 'Black and Blue' salvia this morning. I wonder where they will go when the storm comes? And the bees too, where do they go? I took this photo last week. 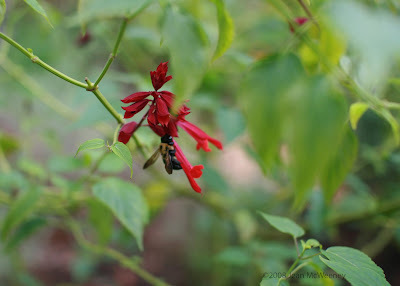 The flower is Salvia Van Houtii ‘Burgundy’. It's a new plant for me this year and I really like it. It has a tendency to flower in spurts, but when it does, the entire plant is covered. I'll post again to let everyone know how the garden fairs. That is, provided we can keep our electricity. Wish us luck! With luck, you and the succulents should both remain snug and protected. I have wondered, too, what happens to the birds in severe storms. The hummingbirds seem such delicate birds to find any sheltered safety in such weather. I understand completely. Hurricanes can be so disruptive. I just finished with Fay and now Hannah is coming our way. Good luck with Gustav! And good luck to you with Hannah! I'm still surveying damage here. It's not too bad but it's still raining and the electricity goes on and off. More later!